The team at Ewing Animal Hospital knows that part of your pet's health and comfort comes from their grooming regimen! 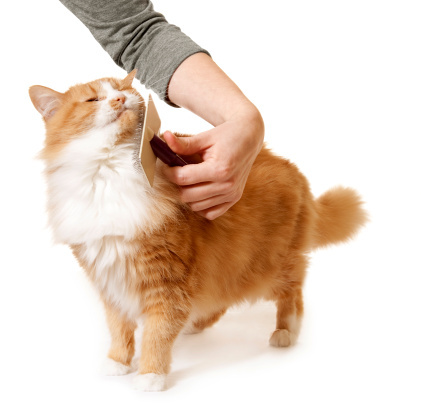 We recommend basic at-home grooming for your cat on a regular basis, to keep them feeling great. If you have questions about any of these grooming processes, or trouble with a stubborn cat, please contact us and we'll be glad to help! Make Grooming as Enjoyable as Possible—For the Both of You! Keep your first grooming sessions short—just 5 to 10 minutes. Gradually lengthen the time until your pet is used to the routine. You should also get your pet used to being handled. Get in the habit of petting every single part of your cat—including ears, tail, belly and back—and especially the feet! - First, use a metal comb and work through her fur from head to tail. - Next, use a bristle or rubber brush to remove dead and loose hair. - Be extra-gentle near her chest and belly. - First, give your pet a good brushing to remove all dead hair and mats. - Place a rubber bath mat in a sink or tub to provide secure footing. - Put your cat in a tub or sink that has been filled with about 3 to 4 inches of lukewarm water. - Use a spray hose to thoroughly wet your pet, taking care not to spray directly in her ears, eyes or nose. If you don’t have a spray hose, a large plastic pitcher or unbreakable cup will do. - Gently massage in shampoo, working from head to tail. - Dry your pet with a large towel. - Begin by applying gentle pressure to the top of the foot and cushiony pad underneath—this will cause her to extend her claws. - Use sharp, high-quality cat nail scissors to cut off the white tip of each nail, just before the point where it begins to curl. - Take care to avoid the quick, a vein that runs into the nail. This pink area can be seen through the nail. - If you do accidentally cut into this pink area, it may bleed, in which case you can apply some styptic powder to stop the bleeding.